A journey through the land of Kings and their great palaces for a Royal Escape in the truest sense. N.B. 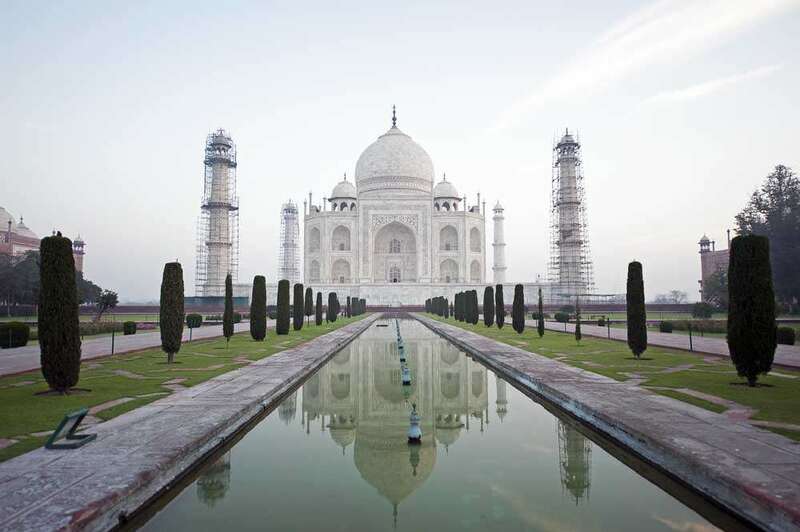 This itinerary extends the normal ‘Golden Triangle’ route but is a guide only. 10 day tours start at circa £1500. You can add time and places to this and upgrade, reduce, or change travel, time and accommodation with us to make this a truly personal journey. Just click ‘enquire’, submit your own personal itinerary request at the end, or simply phone us. From the deserts of Thar in Jaisalmer to the pristine lakes of Udaipur, this journey is meticulously crafted to bring you tales of a bygone era of this truly magnificent state with its rich and deep rooted culture and heritage. You’ll visit the desert of Thar in Jaisalmer, The Blue city of Jodhpur famous for its Mehrangarh and luxurious Umaid Bhawan palace, the city of Lakes of Udaipur, the Pink city of Jaipur and the home to love – the Taj Mahal – Agra. Nor will you miss the cultural amalgam of Delhi which serves as your entry and exit point to India. You’ll spend your first night just relaxing in The Imperial in Janpath, which is the epitome of comfort and style. 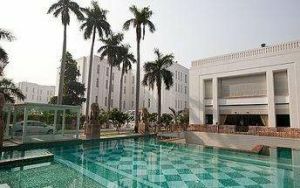 The Imperial is a 5 star hotel in New Delhi and one of our personal favourites. The hotel was built in 1931 and it’s design is contemporary with a colonial style. It is located on Janpath and is steps away from the shopping district and major attractions of the city. Modern and spacious rooms are fitted with high ceilings, a flat screen cable TV, minibar and tea or coffee making facilities. Bathrobes, toiletries and a hairdryer are provided. The hotel offers concierge assistance for tour and theatre information. Babysitting services and free overnight shoe shine services are provided. Yoga classes and a book shop are available. English afternoon tea is offered at The Atrium while Italian specialties are served at San Gimignano. Daniell’s Tavern and 1911 Restaurant and Bar are available for live entertainment and drinks. After breakfast, a full day city tour of Old & New Delhi. You’ll travel into Old Delhi where you’ll visit the Jama Masjid, one of the largest and oldest Mosques at over 350yrs old. 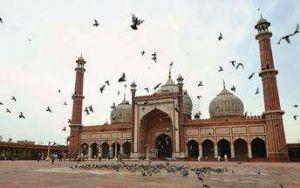 The majestic Jama Masjid – meaning ‘world-reflecting’ mosque – is Old Delhi’s principal place of worship, and the largest and most renowned of its kind in India. Built in the 17th century by the Mughal Emperor Shahjahan – who also built the Taj Mahal and the Red Fort – it’s an elaborate structure featuring an expansive geometric base topped with globe-shaped minarets crafted from strips of red sandstone and white marble, and a massive courtyard that can hold up to 25 000 people. Your entrance ticket will include the climb to the top of a minaret, so don’t be waylaid by opportunist ‘guides’ who’ll charge you extra for showing you the correct staircase! From there, you’ll take a rickshaw ride through the narrow lanes of old market seeing colourful textiles, spices and numerous other products amidst the bustling crowds that will make you familiar with the real roots of the city. Your ride will end at Red Fort for a quick photo stop from outside. We find it more impressive from outside than from within. You’ll now visit New Delhi which feels like a different city altogether. Visit Qutub Minar and drive past India Gate, the government buildings lining Janpath on your way to Bangla Sahib – the famous Sikh Temple. Your time in Delhi is as much about acclimatising yourself to the sheer volumes of people and sound in India as it is about the sights. As you leave the city so he world becomes a quieter place – so don’t be discouraged. Anyway, The Imperial is your sanctuary, by any definition. 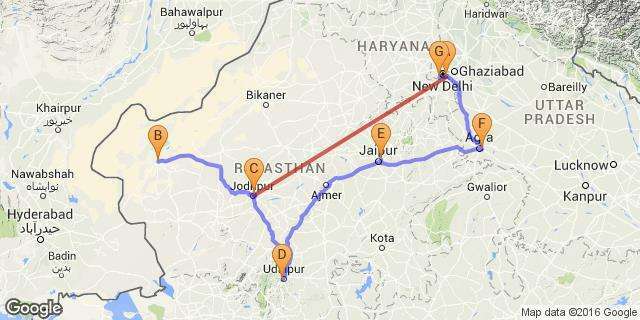 JODHPUR – JAISALMER: – DISTANCE 290 KMS DRIVING TIME: 05 HRS APPROX. After breakfast, you will transfer to the airport to connect with your flight to Jodhpur. On arrival at Jodhpur airport, you’ll drive straight to Jaisalmer, or ‘island in the sand’ as it’s also known. Founded in 1156 and lying at the extreme edge of Rajasthan, Jaisalmer is a tiny jewel in the heart of the Thar, Desert. Once the capital of the Bhati Rajputs, the medieval city rises in a sea of sand on a low range of hills surrounded by a stone wall three miles around – a towering vision in delicate yellow hue-only infrequently broken by green oases. The jewel of Rajasthan, Jaisalmer is a dream come true for intrepid travellers, with the impressive sight of the sandstone Jaisalmer Fort rising above town, for a moment quelling your wanderlust. Situated in the western corner of Rajasthan, this desert hub offers much for visitors to immerse themselves in, from sacred Jain temples to the beauty of Gadisar Lake and its holy ghats, to the narrow bazaar lanes draped in colourful cloth and littered with Rajasthani joothies (slippers) and trinkets. A World Heritage Site, Jaisalmer Fort is one of the oldest forts in Rajasthan and the only ‘Living Fort’ in the country. Architecturally pure and true to an ancient craft, this magnificent hotel is a gateway to the Thar Desert offering it’s guests a wonderful sense of space. 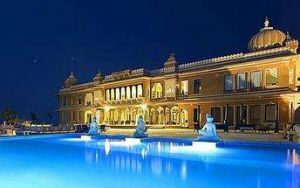 Suryagarh is not just a hotel but also a representation of a unique way of life, carefully preserving the traditions of the past yet framing them in a modern idiom. Amidst shifting sands, it offers a constancy of service, and indeed a bastion of luxury. The rooms and suites are testimony to the pomp of Rajputana. Cosy en-suite dinners, delightful alfresco grill and dining arrangements, empire era bar and scores of lovely add-ons make it the ideal venue for a ‘do nothing, go nowhere’ holiday. 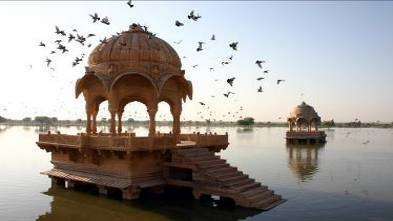 After breakfast, you’ll tour Jaisalmer for the morning, visiting Gadisagar Lake, Jaisalmer Fort with its numerous Jain Temples, the streets of the fort itself and Nathmal and Patwa Havelis. In the Evening you’ll be driven to Sam, 30 minutes out of Jaisalmer, to witness the magnificent sunset over the mighty dunes as you enjoy a short camel ride. DISTANCE 290 KMS DRIVING TIME: 05 HRS APPROX. After breakfast, you’ll drive to Jodhpur, once the capital of the Marwar State. Jodhpur appears to tumble down a low sandstone hill, right to the edge of the great Thar Desert. Reminiscent of Chefchaouen, it’s blue counterpart in Morocco, this charming desert hub is fondly known as the Blue City because of the blue Brahmin houses dotted all over the walled city. Colourful bazaars and food stalls line the narrow lanes where daily life is abuzz in picturesque Indian busyness. On arrival, check into the hotel prior to your half day city tour of Jodhpur. 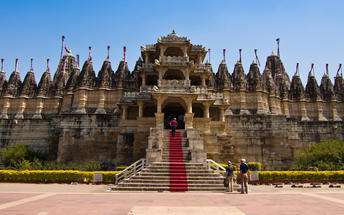 The tour begins with a drive to the old city where you’ll enjoy a Tuk-Tuk ride from the city to the Jaswant Thada, Umaid Bhawan Palace and Mehrangarh Fort. Mehrangarh Fort rises four hundred feet above the skyline of Jodhpur from its rock precipice on Bhaurcheeria hill. The foundation of Mehrangarh Fort was laid on May 12, 1459 by Rao Jodha, the fifteenth Rathore ruler who wished to shift the capital from nearby Mandore to Jodhpur. In all its history, Mehrangarh Fort has never been taken in a siege. Mammoth and imposing from the outside, the interiors of the fort are light and detailed in contrast. 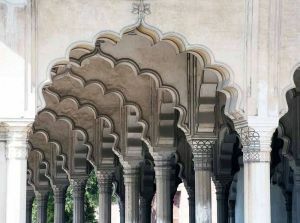 Several palaces can be found inside the complex, boasting intricate carvings and sprawling courtyards. Spend time in the local markets of Jodhpur and see the famous clock tower ; indulge in some good local shopping for spices and footwear. Staying at Indana Palace Hotel is staying in a fusion of worlds created across 80 elegantly appointed rooms and 8 suites. Traditional Rajasthani touches in the decor meet modern conveniences and comforts. The wide and varied cuisine and dining experiences at Indana with 4 dining venues, Anghiti Restaurant which is a multi-cuisine establishment serving up delicacies accompanied by gourmet fare amidst an ambiance created by royal Rajasthani motifs, carvings and furnishings. The Lotus Cafe is a coffee shop serving quick snacks, as well as light meals and beverages. The I Bar pours out fine wines, whiskeys, vodkas, gins, alongside an extensive menu of cocktails and finger foods. Lastly, the Courtyard transforms into a colourful dining spot with a festive atmosphere and vibrant folk entertainment. Amenities for leisure offered at Indana Palace Hotel include a swimming pool, Jacuzzi, a spa, beauty salon, health club, billiards room, children’s play area and a boutique store selling local arts and crafts, fashion, jewellery and travel books. DISTANCE 260 KMS DRIVING TIME: 05 HRS APPROX. After breakfast check out from hotel and commence drive to Udaipur. The small town of Ranakpur is home to what is arguably the most spectacular of all India’s Jain temples. The complex rests on a lush mountain slope and encompasses a series of temples dating to the 15th century, all constructed from white marble and featuring exquisite decorative detail. The main temple, Chamukha, is a multi-tiered structure with no less than 80 domes and over 1400 pillars, all of which are intricately carved with unique designs – no two are alike. As the light changes during the day, so does the colour of the temple interior, shifting from golden to cream and then pale blue at dusk. From here, continue drive to Udaipur. Upon arrival, check in to your hotel. The evening is free to explore the town on your own or to relax at your hotel to unwind from the journey. Fateh Garh is perched on a hill within the very heart of Udaipur. 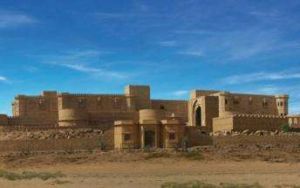 Derived from the Urdu word for victory ‘Fateh’, and ‘Garh’ or fortress in Sanskrit, Fateh Garh is really an invitation to investigate and understand ourselves – considered ‘true victory’ in Eastern thought. Dubbed the ‘Venice of the East’, the city of Udaipur is built around three interconnected lakes – Lake Pichhola, Fateh Sagar Lake and the smaller Swaroop Sagar Lake – and encircled by the hills of the Aravalli mountain range. 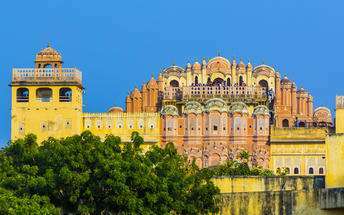 It is home to an array of ancient temples and fairy-tale palaces (several of the latter have been converted into luxury heritage hotels) and is known as one of Rajasthan’s most beautiful and romantic cities. Must-see attractions include the City Palace, the Lake Palace (set on a small island in the middle of Lake Pichola) and the Udaipur Solar Observatory – Asia’s premier solar-gazing site. After an early breakfast, you’ll embark on an heritage walk in Udaipur. You’ll visit the Jagdish Temple, later walking through the alleyways , observing the local people living here. You’ll see the homes of Merchants, warrior and priest communities and the diverse attractions of craftsmen making a bronze bases for steel utensils, spice markets, Shreenath Ji (Lord Krishna Temple), the wholesale vegetable market and the bridal wear market. Now you’ll visit The Maharana’s City Palace standing on the edge of the Lake Pichola and in the afternoon enjoy exclusive boat ride on Lake Pichola and visit Jag Mandir. After breakfast you’ll drive to Jaipur. Gateway to the state of Rajasthan, Jaipur offers a heady mix of old and new India. The capital of Rajasthan, Jaipur has numerous exquisite buildings of rose coloured terra cotta, thus giving it the name of ‘The Pink City’ with pink and orange being the dominant colours. Jaipur’s nickname was coined in 1876 when a visit by the Prince of Wales prompted the government to paint the Old City terracotta pink, traditionally the colour of hospitality, to welcome the Royal. Jaipur was founded in 1727 by Maharaja Sawai Jai Singh II, a soldier, ruler, and scholar in mathematics and astronomy, after whom the city has been named. Jaipur is home to splendid fortresses, majestic palaces, temples and a must-see medieval observatory. The colour effect is magical at dusk when you’ll enjoy a rickshaw ride while going to Birla temple to attend an evening ceremony. The Trident Jaipur Hotel holds breath-taking views of the serene Mansagar Lake and the Aravalli range. 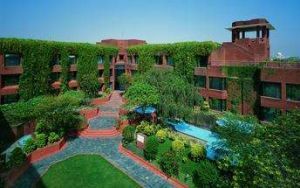 The hotel has 132 guest rooms, and is situated en route to Jaipur’s well known Amber Fort. After breakfast, commence drive to Amer Fort. On the way you’ll stop for a photo at Hawa Mahal which is best done in the morning hours. One of Jaipur’s most recognised buildings, the Hawa Mahal (Palace of Winds) is known for its iconic façade. Small windows, decorated with intricate latticework create a honeycomb-like appearance. The original intention of the lattice was to allow the royal ladies to observe everyday life in the street below without being seen. The cooling effect, provided by the breeze passing through the small windows, gave the palace its name. Architecturally and aesthetically its far more significant and interesting from the outside than from within. Amber Fort, officially known as the ‘Amer Palace’, is one of the most famous forts of Rajasthan attracting around 4000 to 5000 visitors a day during peak tourist season. 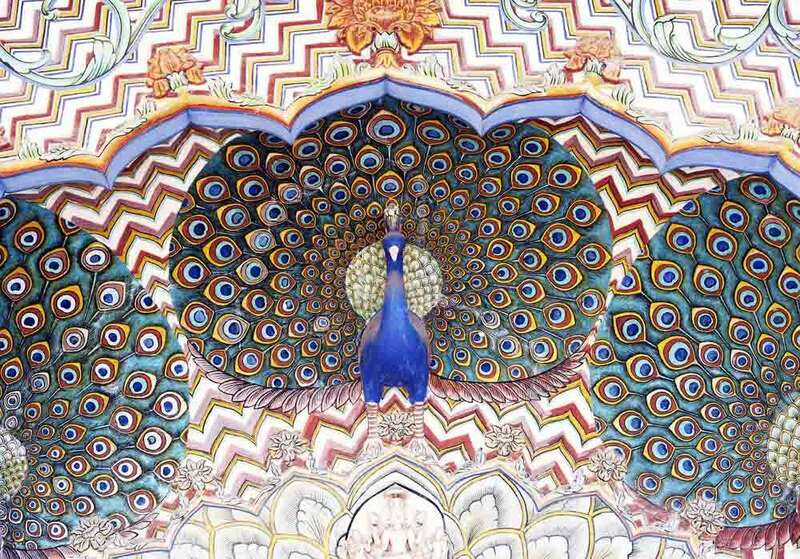 The palace was named after the small town of Amer, where it is situated – only eleven kilometres from Jaipur. Perfectly picturesque, this 16th century hillside residence is well preserved, boasting grand pavilions and mirrored halls that open onto flourishing gardens and courtyards. At Amer Fort, arrive early to enjoy an Elephant ride while going up the huge fort ramp, followed by a photo stop at Jal Mahal. 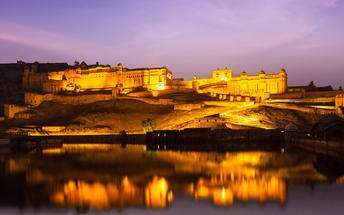 There are mnany fascinating facets of Amer Fort that make an amble around well worthwhile. 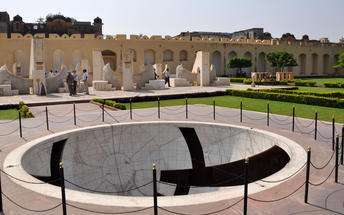 Next visit Jantar Mantar – Maharaja Sawai Jai Singh’s Observatory followed by a visit to City Palace. In 1734, the year of its completion, the Jai Singh Observatory was the last outpost of medieval science. From the outside, the eighteen fixed observational instruments look more like playground apparatus than sighting devices, but they were used to measure the position of the sun, stars and planets. Built by Jai Singh, the first Maharaja of Jaipur who founded the city in 1727, the observatory is one of a handful but the Jaipur observatory is the largest and best preserved of these. It has also been tidied up in recent years and is really worthwhile the stroll around. Also…There are options for a traditional meal at Samode Haveli (a heritage hotel) or at an Indian home for a Cooking Demo along with a Lunch / Dinner session with a Local Indian Family. It’s nothing similar to a Cooking Demo organised at a Hotel but a unique experience where the lady from the family will show you day to day cooking styles – and you can also join her. After cooking you’ll enjoy lunch / dinner with the family and share some of your experiences with them. After breakfast, commence drive to Agra. En route, visit a village called Abhaneri which is prominent for ‘Baoris’ (step wells), which are the unique invention of the tribal people for harvesting rain water . The present name of the village, ‘Abhaneri’, is believed to be a mispronunciation of ‘Abha Nagri’ or the ‘city of brightness’. This ancient village in Rajasthan is renowned for its post-Gupta or early medieval monuments, Chand Baori and Harshat Mata temple. Though the village is in ruins now, tourists throng the village to see Chand Baori which is a huge step well, a unique idea conceived by the tribals to work as a water reservoir. 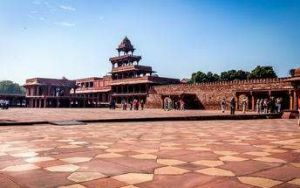 Next visit Fatehpur Sikri, “the Ghost City” which lies west of Agra. 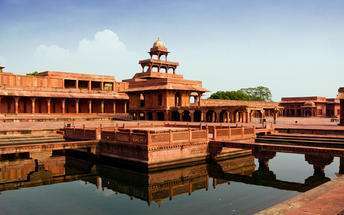 A highlight in the province of Uttar Pradesh, Fatehpur Sikri served briefly as the capital of the Mughal Empire from 1571 to 1585. This World Heritage Site is rated as one of the best preserved collections of Mughal architecture in India. Surrounded on three sides by a six kilometre wall, with the fourth side being a lake at the time, a day could be spent simply exploring the elaborate structures within. Its remarkable that this city is so well preserved and although visitor numbers have increased over the years we’ve been visiting, it still captures our imagination each time we step into its expansive central forum. After checking into your hotel you have a free evening to visit local markets or to relax at your resort. The ITC Mughal is sprawled over 35 acres of luxurious gardens, and in close proximity to the Taj Mahal. The ITC Mughal is a 5 star luxury hotel in Agra representing Mughal architecture, albeit for us it’s appearance is also vaguely reminiscent of local council offices! 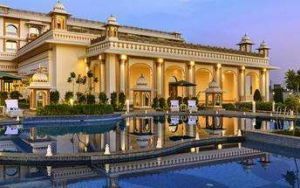 This luxury hotel comprises of 233 rooms and suites all offering a peak into the Mughal history and tradition through it’s design and architecture.The structure is surrounded by Mughal gardens, fruit and flower bearing trees and shaded walkways. Hotel amenities at the ITC Mughal includes cycling and jogging tracks, a mini-golfing green, a swimming pool and the spa Kaya Kalp – The Royal Spa, along with a range of gourmet fine dining options. Home of the world-famous Taj Mahal, Agra is one of India’s prime tourist destinations for specifically this reason, though its attractions also extend to an array of other impressive historical sights. These include the red-hued Agra Fort, the sacred Jama Masjid mosque and Itmad-ud-Daulah’s tomb, with its white marble facade embellished with intricate inlaid designs and semi-precious gems. The Taj, however, is in a league of its own and needless to say is a must-see for any visitor to Agra. We’ve always likened it to a dollop of cream in the middle of a cowpat, although steps are being made to improve Agra city itself. Commissioned by the Mughal emperor Shah Jahan in the 15th century as a memorial to his beloved wife Mumtaz Mahal, the Taj is an architectural masterpiece of exquisite craftsmanship and perfect proportions. We must have visited it at least six times and never fail to be captivated by some new aspect of its beauty. Early morning visit to the Monument of Love – Taj Mahal (Taj Mahal remains closed on every Friday). Try to arrive as early as possible (gates normally open at 6am) as the pink suffused marble from the rising sun adds an ethereal beauty that can only be enhanced by the fact that there are relatively few people who’ll you’ll be sharing it with at that time. 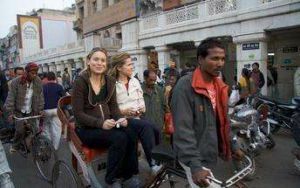 Return to your hotel for breakfast and then continue with visits to the remaining monuments in Agra. After these visits, start driving towards Delhi. After breakfast, you will be provided with transfer to Delhi International airport to connect with your onward flight.